Fancy taking a screening test for cancer? Surely that’s a good idea? But first you need to understand that there’s a risk, and that it may cause you more harm than good. Cancer remains the third commonest cause of death after strokes and heart attacks. There are tests available for many cancers, and screening is applying these tests to the population as a whole, rather than just people who arrive in doctors’ surgeries. The aim is to spot people who have early cancer, or may be at an increased risk of developing cancer in the future. There are a number of cancer screening tests available, but across Europe most health systems only offer screening programmes for three types of cancer, namely breast, cervical and colorectal cancer. The UK National Screening Committee oversees screening for the NHS. All screening tests and programmes whether for cancer or not, are expected to meet certain criteria. There are a number of important criteria that need to be met before a screening programme can be set up. The condition that is being screened for needs to be an important health problem. The incidence of the disease and its risk factors should be known. How the condition develops should be well understood, and there should be a means of intervening in the disease process at an early stage that reduces or stops the risk of disease progression. There also needs to be evidence that intervening early leads to better outcomes. The test should provide value for money; be relatively easy to perform on lots of people, and be acceptable to the population. In any screening programme some people will be diagnosed with the condition when they don’t have it (false positives), and there will also be some people with the disease who are missed (false negatives). No test is perfect, so false negatives and false positives are an inevitable part of any screening programme. However, it’s crucial that these rates should be known and are not too high. There’s also no point screening for a disease if nothing can be done about it. So there needs to be a treatment or treatments available that have been shown to work. 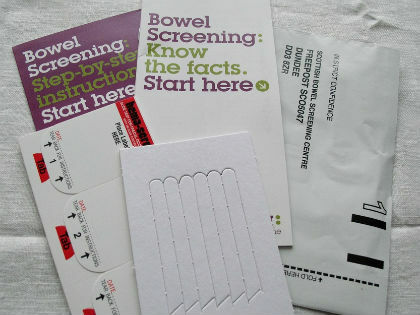 Bowel cancer is an example of a condition that has a good screening test and programme. It is the third commonest cancer in the UK. Men have a one in fourteen chance of developing it sometime in life, and for women the risk is one in nineteen. In 2008 there were 38,000 bowel cancer cases in England and each year about 16,000 people in England die from the disease. Part of the problem is that the disease often has no symptoms in its early stages. If caught early, surgery can often cure the disease. But if it is not picked up until later, then there is no cure, just palliative treatments that control symptoms and only prolong life expectancy. The screening programme is for men and women aged between 60 and 70 who are invited to take a simple, relatively cheap, test. This involves providing a stool sample, which is analysed for the signs of early cancer. If signs are spotted then there are good, well understood treatments available. Screening for prostate cancer, on the other hand, does not satisfy enough of the NHS criteria for it to be an acceptable screening programme. Like bowel cancer, prostate cancer is an important health problem. Each year in the UK, approximately 35,000 men are diagnosed with prostate cancer and there are about 10,000 deaths from the disease. There is a screening test available – a blood test – that is cheap, easily available and acceptable to patients. However the test is controversial. It has a high rate of false negatives and positives, meaning it can either falsely reassure, or it can raise concerns for individuals who may go on to have unpleasant diagnostic tests but do not have prostate cancer. Treatment for the early stages of the disease may be associated with unpleasant side effects, which include incontinence and impotence. As a screening test there is no evidence that it decreases mortality or morbidity at a population level. Even where there is evidence that a screening programme can improve morbidity or mortality, there remain ethical issues and considerations. As an example, the UK’s national screening programme for cervical cancer was started in 1988 and is estimated to prevent 5000 deaths per year. However the individual benefit to a woman is very low. A research study in Bristol in 2003 published in the BMJ, showed that 1,000 women need to be screened for 35 years to prevent one death. A practice nurse performing 200 tests a year would prevent one cervical cancer death every 38 years. Forty percent of young women face the prospect of having an abnormal smear result during the lifetime of screening (between 25-64 years); which creates huge anxiety and leads to further intervention, and these tests are intrusive and unpleasant. If women were made aware of these facts and figures they may be less willing to participate in screening. Yet this screening programme saves lives and relies on the goodwill of the individual women taking part. GPs are also paid to achieve screening targets for cervical cancer. Given all women aged between 25 and 64 years are invited for cervical screening every three years, the question should be asked: will practices invest a lot of time discussing the potential harms of cervical screening with individual woman when the practice will be financially penalised if it does not meet its screening targets? So if you are invited to take part in a screening programme, you may wish to discuss with your doctor not only the potential benefits but also the potential harms of screening.